All papers and articles on this website are copyrighted. Access to this website does not grant any rights to copy, publish, sell, license or distribute any included materials, in any form or media, without the express, written permission of the individual copyright holders. Editorial opinions expressed herein are solely those of the respective authors. Without doubt, special thanks must first be given to Joseph Marino and Sue Benford for their amazing efforts in organizing and managing what was arguably the best Shroud conference in many years. I believe I can speak for everyone who attended in extending my heartfelt thanks and deepest appreciation for their excellent (make that phenomenal) efforts. Included in the Conference Speakers and Topics section below are links to the most of the Abstracts submitted to the conference, along with links to the full papers that were presented. A special word of thanks is in order to Dan Porter for his work in making these available on the conference website, www.ohioshroudconference.com. The link to the papers page is http://www.ohioshroudconference.com/papers.htm. You will also find links to MP3 audio files of most of the presentations made at the conference. These are courtesy of Russell Breault and his excellent website, www.shrouduniversity.com. Russ diligently recorded the audio of almost the entire conference singlehandedly and these files are a wonderful testament to his dedication and professionalism. Thanks to Russ, you can hear what was said for yourself. I also want to add my personal thanks to Russ for including on his website a WMV file of the STURP Tribute Video that I presented at the conference. A final note of thanks must be given to the entire Shroud Science Internet Group and its many members who contributed their ideas, talents, inspiration and sponsorship to help make this conference a truly memorable event. 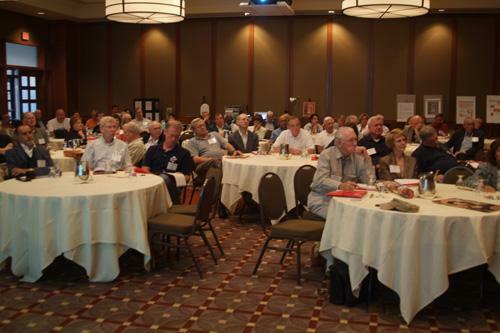 On Thursday evening, August 14, 2008, at the beautiful Blackwell Inn and Conference Center on the grounds of Ohio State University, Joseph Marino, conference organizer, delivered the opening remarks and officially got the Ohio Shroud Conference underway. 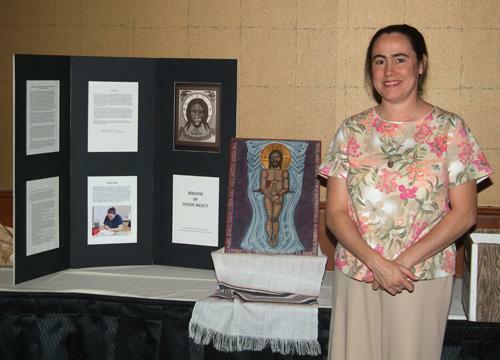 Named "The Shroud of Turin: Perspectives on a Multifaceted Enigma" and sponsored in part by the Shroud Science Internet Group, the conference attracted more than 85 attendees from Australia, Canada, France, Israel, Italy, Japan, Panama, Spain and the United States. 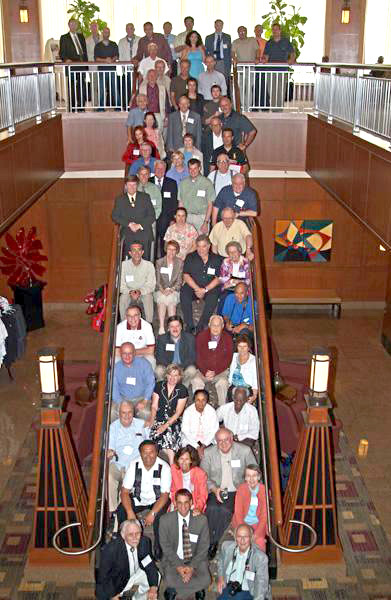 The conference, dedicated to the late Raymond Rogers, head of STURP's chemistry group, was held in part to commemorate the 30th anniversary of STURP's 1978 scientific examination of the Shroud and the 20th anniversary of the ill-fated radiocarbon dating in 1988, both significant events in the Shroud's history. One of the true highlights of the conference for me personally, was the opportunity to see former STURP team members John Dee German and Joseph Accetta again, for the first time in 28 years! Both had been away from any involvement in Shroud research for many years so it was great to see them again and get their current perspectives on the state of Shroud science. Of course, my dear friend and fellow STURP team member Ken Stevenson was also at the conference, but he has remained active in Shroud studies, so we have seen each other many times over the years. Sadly, Tom D'Muhala, STURP's former President who was planning to attend, was unable to do so at the last moment and was sorely missed, as he would have been the fifth STURP team member present. 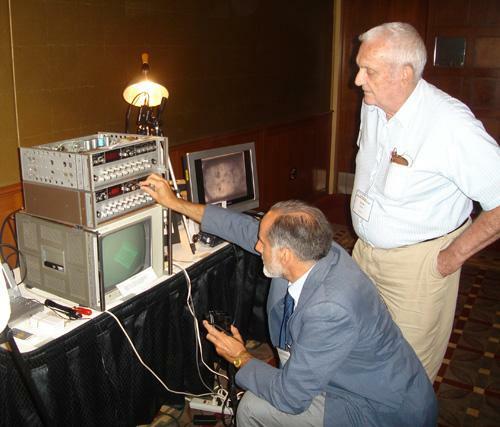 Also present was Pete Schumacher developer of the VP-8 Image Analyzer. Although he was not a STURP team member himself, Pete's important work and the VP-8 Image analyzer were instrumental in catalyzing the formation of the STURP team itself. The opening address of the conference was delivered by Rex Morgan, long time Shroud researcher, author and esteemed publisher of Shroud News, a printed newsletter he distributed by mail for many years. Rex, who came all the way from Australia, is a great orator and has dazzled past conferences with his dynamic delivery and brilliant speeches. This year was certainly no exception and he held the audience riveted for almost 90 minutes, covering an amazing amount of material. Even more exciting is that for the first time, you can listen to his entire speech for yourself on the Internet. You will find the MP3 link included below in the chronologically listed Conference Speakers and Topics section. From a purely scientific perspective, a number of excellent and important papers were presented. 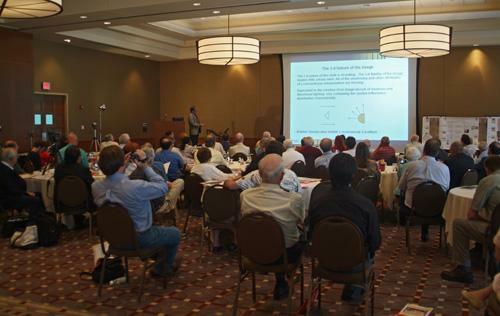 Most notable among these was the paper presented by Robert Villarreal of Los Alamos National Laboratory (LANL). The paper, titled, "Analytical Results on Threads Taken from the Raes Sampling Area (Corner) of the Shroud" presented the data obtained by nine Los Alamos scientists that examined Raes Sample threads from the Raymond Rogers Collection, which is in my care. When I first received the materials from the Rogers family, I noticed that one important sample was missing, Raes #1, the apparent end-to-end spliced thread that Rogers had identified. More than a year passed before I received the contents of Ray's computer and it was only then that I discovered that Ray had given the sample to several of his LANL colleagues for scientific analysis just two weeks before he died. Fortunately, Ray had included their names, so I immediately contacted Bob Villarreal at the lab, introduced myself and asked him about the missing sample, which of course he still had in his possession. At that point (and much relieved that I had found the sample), I asked him if he would be willing to continue the work he had begun several years earlier with Ray. He enthusiastically agreed and over the past year I made some additional samples available to him and his team. 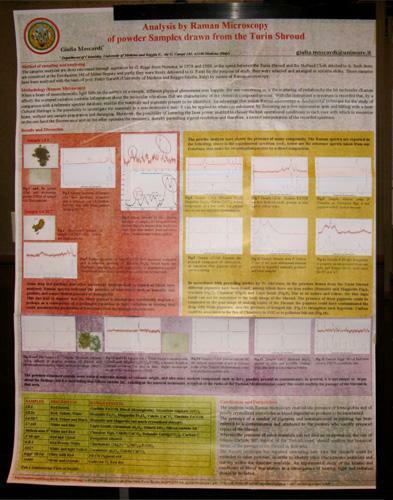 This paper presents the results of their analyses of those samples. Another fascinating and important paper was presented by Ryan L. Parr of Genesis Genomics Inc., a highly respected DNA analytical laboratory in Ontario, Canada. The paper was titled �SEM-EDXA Analysis of Red Particles Removed from the Underside of the Turin Shroud in 1988� and presented the data gathered by Ryan and his team from the "red particle" samples provided to him by Giulio Fanti from the Giovanni Riggi de Numana Collection. In the paper he explains why DNA analysis was not feasible with these particular samples and provides an enlightening overview of the difficulties in modern DNA analyses due to high levels of contamination. As complex and technical a subject as this is, Ryan made it very simple and clear in his excellent presentation. Of course, it was a great pleasure to see my two old STURP colleagues, John Dee German and Joseph Accetta present their current perspectives on Shroud science. John presented an optical physicist's perspective on the Shroud image and Joseph discussed spectroscopy of various processes associated with image formation on the Shroud. It was truly a great pleasure to see them at the podium and it reminded me again of the caliber, skills and professionalism of the men that comprised the STURP team. A prominent figure at the conference was Prof. Giulio Fanti, Shroud Science Internet Group member from the University of Padua in Italy. Not only did he present a number of scientific papers representing his own research on various Shroud related subjects, but he also presented the papers of several other Italian researchers who were unable to attend. Giulio also brought with him the Shroud research of a number of his students (in the form of student entry poster papers that were exhibited at the conference). 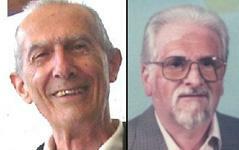 In fact, Giulio's students won the top three cash prizes. See below for photos and details of the Student Entries. Dedicated students of the Shroud will certainly recognize the names of many of the conference presenters, including archaeologist Paul Maloney, who discussed the 1988 c14 dating, historian Prof. Dan Scavone, who gave an informal presentation on the Holy Grail and presented a formal paper on the missing 150 years in Shroud history, Prof. Avinoam Danin, Israeli botanist, who presented new information on the botany of the Shroud, Russell Breault, noted Shroud scholar and lecturer who gave us a real time look at his awesome Shroud University website, Dr. Alan and Mary Whanger, who presented their theories on the right eye image and gave their well known polarized light overlay demonstration, Ken Stevenson, who presented a stirring and emotional look at the Shroud from a spiritual point of view, Chris Knabenshue, who provided a scriptural view of the meaning of the Shroud and historian Jack Markwardt, who discussed ancient Edessa and the Shroud. Joe Marino and Sue Benford presented two papers, one providing additional historical and scientific evidence regarding invisible mending and the other discussing surface chemical discrepancies in the c14 dating region of the Shroud. 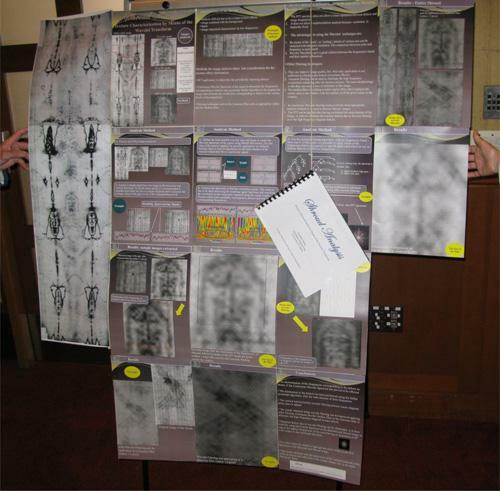 This latter presentation was based on their recent peer-reviewed paper titled, "Discrepancies in the radiocarbon dating area of the Turin Shroud", which was published in the July-August 2008 Issue, vol 26 n 4 of the international journal, Chemistry Today. There were also a number of new faces making presentations at the conference, including Italian researcher Paolo Di Lazzaro, who discussed the origins of the body image, Spanish researcher Dr. Miguel Lorente, who presented a controversial forensic analysis of the Shroud, Raymond J. Schneider, Shroud Science Internet Group member who presented a paper on digital image analysis of the Shroud, Barbara Faccini, (also a group member who was unable to attend personally, but two of her papers were presented by Giulio Fanti), and Petrus Soons, holographic researcher from Panama who made one of the most dramatic presentations at the conference. Around four years ago, Petrus and his lovely wife Dalis visited me at my studio in Los Angeles and showed me the first generation holographic images he was creating from the Shroud. Frankly, I was not particularly impressed with the results and this was apparently not lost on Petrus. As he explained to me at the conference, after that meeting he literally started over and his new results are nothing short of spectacular. He showed a number of holographic images, including a most impressive video of a full ventral Shroud image, rotating left and right in full 3-D. I am hopeful that he will make this video available online at some point in the near future. Rest assured that I will link to it once it is available. Another important feature of this conference was the opportunity given attendees to ask questions of the speakers, usually at the end of the morning or afternoon sessions (where time permitted). These were recorded by Russ Breault and I am very pleased to include links to the MP3 files of these Q & A sessions so that you can hear them for yourself. 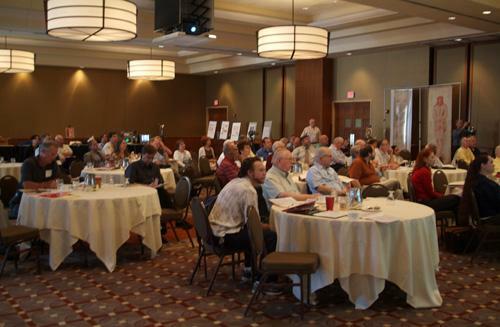 In addition, two separate, dedicated two hour sessions were scheduled for open forum discussions of two highly controversial topics, �20 Years After - Where Do We Stand with the Carbon Dating?� and �The 2002 'Restoration' - Its Impact and Prospects for Future Testing� (and other miscellaneous topics). I was privileged to moderate these sessions and stand in for William Meacham of the University of Hong Kong, who was originally scheduled to moderate them, but was sadly unable to attend himself. Once again, links are provided to the MP3 audio files so you can hear these discussions yourself. Also attending the conference was my dear friend Kevin Moran, retired Kodak optical engineer and long time Shroud scholar. Of course, Kevin brought with him his pride and joy, a VP-8 image analyzer configured much the same as the one used in the 1970's by the STURP team. Kevin and his VP-8 have become important fixtures at Shroud conferences here in the U.S. and he has singlehandedly given more of us access to this important instrument than anyone else. In fact, in 1997 Kevin was gracious enough to allow me into his home with all of my video equipment and we spent an "all nighter" shooting video off the VP-8 green screen display. Of course, Kevin's VP-8 is still functioning because of the ongoing (make that neverending) efforts of he and Pete Schumacher to keep it "alive." Included below is a photo of Giulio Fanti taking the VP-8 for a test drive as Kevin looks on. Finally, I must mention one of the most important aspects of the conference, the ability to see, reminisce and "hang out" with so many of my dear friends. Attendees who did not make presentations at this conference included many familiar names, like Richard Orareo, owner and curator of the Boston Collection of Shroud Art, Dan Porter, Shroud scholar and founder of several important Shroud websites (including the conference website), Mark Borkan, long time student of the Shroud, Mary Hines, Shroud lecturer with an extensive medical background in blood chemistry, Mark Antonacci, noted Shroud author and his associate, physicist and Shroud researcher Art Lind and many others. For a complete list of every presenter (including a few who were unable to attend in person), see the Conference Speakers and Topics section below. In the end, I think this conference will be remembered not just for the papers that were presented, but for its comfortable openness, its free and fair exchange of ideas, its often heated but always respectful discussions and its overall spirit of camaraderie and cooperation. And that is an outcome truly befitting the object of our attention. 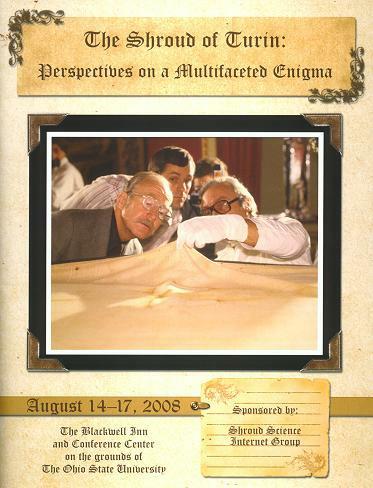 Opening Keynote Address - "The Shroud: An Eternal Challenge"
EDITOR'S NOTE: This paper was originally written in 2004, when Ray Rogers examined linen fiber samples from the Sudarium of Oviedo at the request of the Oviedo authorities. He submitted this paper to them for their approval, which they gave, and Ray planned to ultimately have it published on this website. Sadly, he set it aside for other Shroud research and it was almost lost after his death, but thanks to Joanna Emery, noted Shroud author who discovered its existence during her correspondence with the Oviedo authorities, it was fortunately "found" again and read (by Joanna) at the August 2008 Ohio Shroud Conference. I am pleased to finally be able to include it here. Click on the title link above to read the paper. "VP-8 Shroud Image Analysis, Impact and History"
�Visibility of the Shroud Image: An Optical Physicist's Perspective"
�Digital Image Analysis of the Shroud of Turin: An Ongoing Investigation"
�Shroud Coins Dating by Image Extraction"
"Statistical Analysis of Dusts Taken from Different Areas of the Turin Shroud"
This was an excellent forum where anyone could speak out and voice their opinons, ask questions and debate the issues. After an electronic audio and PowerPoint introduction by William Meacham, who was originally scheduled to moderate the session but sadly, was unable to attend, a very spirited and fascinating two hour discussion ensued. 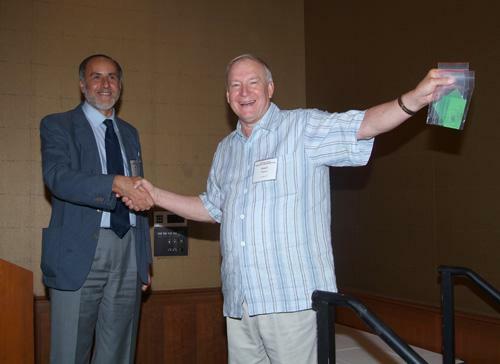 It was capped off with a stunning moment at the end of the forum when Giulio Fanti of the University of Padua in Italy, handed over three Shroud fiber samples from the Giovanni Riggi di Numana Collection to Robert Villarreal of Los Alamos National Laboratory for further, detailed analysis. This great gesture of international cooperation brought the entire room to its feet in applause as we all realized we were witnessing some actual progress being made. I think that everyone agreed this was an excellent first step in renewing the attitudes necessary for true international Shroud research. "The Shroud of Turin and the Bilirubin Blood Stains"
"Advancing the Shroud into the 21st Century: Reaching the Next Generation"
�Focus Projects for Student Involvement in Researching the Scientific Properties of the Shroud of Turin"
�The Tangible Emmanuel: How the Scriptures Shed Light on the Meaning and Presence of the Shroud of Turin"
One of the most important features of this conference was a category for student entries. Frankly, I don't remember seeing this done at any previous Shroud conferences, but I think it is a great idea. Thanks should go to Ray Schneider for managing this part of the conference and serving as the Poster Paper Chairman and certainly to the Shroud Science Internet Group for including it in the first place. I strongly believe that this category should be included at all future conferences to encourage more young people to become involved in Shroud research. Although the actual number of entries was less than I would have hoped, four excellent student presentations were exhibited and acknowledged at the conference. Three of the award winning entries were from Italy and all three of them were by Giulio Fanti's students. Giulio should be congratulated on the high quality of his students' work. I was rather disappointed that only one American entry was submitted and hope that more will participate in the future, but as you will see below, that one entry was an excellent one.